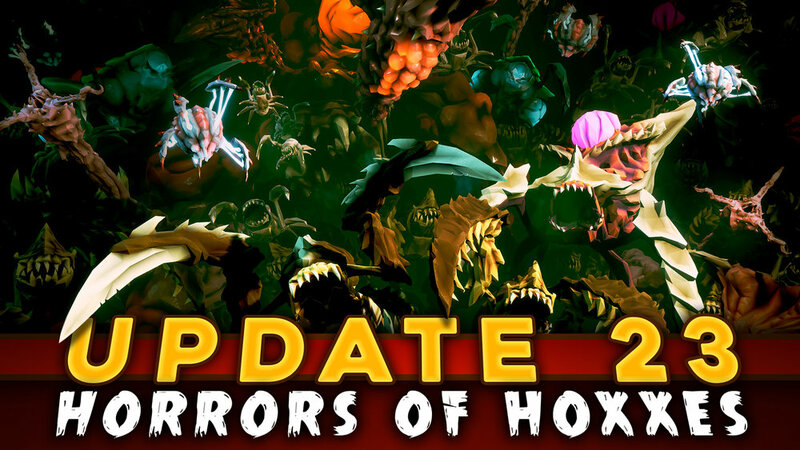 With Update 23: Horrors of Hoxxes, we chose to focus on one of the most often requested improvements for the game (ourselves included): More aliens! Well, more aliens you shall have - alongside a ton of other stuff, we’ve got a bunch of new Hoxxes natives for you to pump full of lead, as well as some much-needed facelifts for some of our old friends. Have a gander at the list at the end of this post for the full notes or dive in as un-spoilered as you please! Either way, we’re pretty proud of this one. Checkmark on 23: Check! Onwards to 24! We still have some design ahead of us before we can fully commit to the headlines on this one (some key members of the team are out of town, attending conferences), but 24 will likely be a less feature-oriented Update, and more focused on polish and improvement of current stuff while we put work into more long-term stuff in the background. So far it looks like Update 24 will bring things like yet more Mods to unlock, at least one new enemy type, and a bunch of UI improvements such as revamped Mission Load and Mission Complete screens, but we’ll have something concrete to share with you soon. P.S. For Microsoft Store Version (Xbox One and PC Version), you have also gain the Hotfix 1, 2, and 3 into the version! See the hotfix lists in the bottom of this post! This distant cousin of the Glyphid Acidspitter is both smarter, faster, and more aggressive. It’ll burrow into the ground between firing off devastating volleys of corrosive goo, making for a high-priority target when spotted. This mysterious Glyphid sends out regenerative waves of spores to its nearby kin, reinvigorating and buffing them. Better take it out quick. A sickening horror of the deep. It’s Bulky and it Detonates. You’ll know it when you see it - and then you’ll likely die. You have been warned. The first species encountered of this awful breed of Hoxxes wildlife. The Trawler has been observed in the Sandblasted Corridor Region and it burrows through sand at high speeds, aiming to catch prey in its’ extended maws as it passes. Don’t stand in front of it. A more durable and fast version of its weaker cousin, the Grunt. Plus...its long-bladed legs deal thrice the damage. Nasty buggers! Another variation of the Glyphid Grunt. This one is heavily armored and has twice the health but is a bit slower than a normal Grunt. In the Radioactive Zone, Praetorians have mutated and now do radiation damage! Better keep your distance. Exploding with radiation! ‘Nough said! They glow in the dark and are radioactive - they’re small enough that the radiation they emit isn’t enough to affect a healthy dwarf, however. New behavior: If the players are hidden in a small hole, the Dreadnought will now destroy the terrain until it gets to them. Can’t stop me now! New attack: Swarmer Egg. Besides the fireball, the Dreadnaught will shoot a projectile full of swarmers. If hits the players, it will also cover them with pheromones, turning them into the target of new enemy swarmer spawns. Regenerating armor. Make sure to attack it while it’s vulnerable. Health values have been modified to conform to this new system. All its attacks and behaviors have been tweaked. The Dreadnaught is now more aggressive, more responsive, and more dangerous. Management wishes you luck. More Nitra is spawning in elimination missions since you will need more ammo to take down a Dreadnought. Supply Pods won’t instakill a Dreadnought anymore - it still deals a good chunk of damage though. Rolling periods are now shorter so it will open up more often to shoot (which almost means more chances for players to shoot it). Armor resistance and base health reduced. It can only be found in Salt Pits now. Radioactive Exclusive Zone didn’t feel like a healthy place to settle down. Received a much-needed model and animation overhaul. Now grabbier than ever! All new model and animations. The glowing bits around embedded crystals like, Aquarq, Jadiz etc. now only glow when said item is close. No more returning to already mined spots! We are still in the process of adding mods to all the gear and we are slowly getting there. After this update, only the Pick Axe and the Grenades are left to do. Number of turrets, target prioritization, build speed, scan angle. You are a special snowflake and now your automated killing machine can be too. Have you ever thrown down a Satchel Charge only to regret it immediately? Well, now you can install a kill switch for safe disarming and retrieval. Plus many other mods like carve size and fear effects. More flares? Longer burn time? Auto-reload? Illuminate the situation with these and other mods. Customize the size, duration and recharge time of your happy place. Please note: You have been refunded credits and minerals invested in previous upgrades! Enemies’ health bars now display status effects such as being electrocuted, etc. They also show temperature variations so players can now know how far from bursting into flames or freezing they are. Management has approved the introduction of an all-new set of armor for the most experienced employees to procure - the mighty Mark 5! All first-person animations now display the correct armor! By popular request, the Supporter Upgrade Armor and Weapons have gotten a material overhaul - now more goldier than ever! The One Year Celebration is over! If you missed getting the One Year Celebration hat while it was available, tough beans! Also, Management has returned beer prices to normal. Drink responsibly (because it’s expensive!). Chatbox: System Messages now green and bold, general line height slightly lowered.